Dorthea Irene Horton was born in Ashland, Wisconsin, in 1903 but moved to Saskatchewan shortly after. Raised by her grandparents, she grew up on a farm not far removed from pioneer days and ways — Saskatchewan did not even become a province until 1905. Dorthea was educated in Swift Current where she attended the Saskatchewan Normal School after high school. She taught at the Swift Current Collegiate Institute from 1924 to 1934. In 1934, Dorthea married Howard Calverley in High Prairie, Alberta. The young couple moved to Sexsmith, near Grande Prairie, where they ran a boarding house and grocery store. The Calverleys moved to Dawson Creek in 1936, making it their permanent home. Planning at first to try homesteading — they both had farm backgrounds — they soon discovered that their other skills were in demand. They settled for an acreage near town where they tried to be as self-sufficient as possible. “I had a pretty good idea how country people coped with life”, she said in an interview later when asked about how successful the farm venture was. 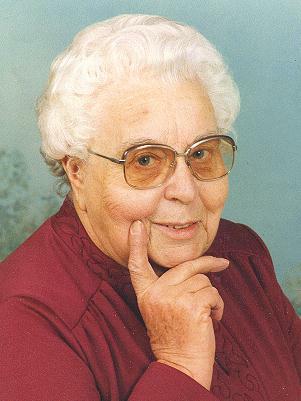 Dorthea Calverley did not consider herself to be an old-timer in Dawson Creek. That honour was reserved, in her mind, for those who had lived in the area before the Northern Alberta Railway arrived. In a 1979 interview, Mrs. Calverley commented that several people had asked her, “Why are you writing the history of the Peace? You’re not an old-timer.” And of course my answer is, “Are you writing it?” And they say, “No”. Then I say, “Do you mind if I do”. The conversation usually ended about there. Mrs Calverley was best known, of course, for her devotion to gathering the raw materials for a history of the Peace. She read widely, interviewed old-timers, gathered newspaper clippings, visited museums and archives and kept up a correspondence with university and government officials in search of answers to questions about the Peace. All of this material eventually formed the Calverley Collection, which now is held in trust by the City of Dawson Creek for all the people of the region. At the same time as she pursued her interest in local history, Mrs Calverley found time to collect and photograph wildflowers from the region. Many of her slides appear in the book, Wild Flowers of Alberta, and she was a regular contributor of plant specimens to the Royal BC Museum. She was a founding member of the South Peace Historical Society and an active member of the Chamber of Commerce and of the Horticultural Society and a number of other groups in the community she loved.. The City of Dawson Creek named her a “Freeman of the City” in 1981 and she was presented with the “Citizen of the Year” award in 1982. The Chamber of Commerce named her an Honorary Life Member in 1986 for her outstanding contributions to the city over the years. Dorthea Calverley passed away in September 1989 after a lengthy illness. She was predeceased by her husband, Howard, who died in 1976. Their only son, Dr. Roderick Calverley, was killed in an automobile accident near San Diego, California, in 1995. Two adult grandchildren, Grant and Christine, and their mother Janeen live in the United States. Mrs Calverley left a lasting legacy in the extensive collection of local history materials known as the Calverley Collection. A federal government program in 1973 and the strong support of the School District Resource Centre made it possible to assemble the heart of that material in a set of bright orange binders called, “History Is Where You Stand”. Nearly 600 articles selected from those binders are now being made available on the Internet through a provincial government grant under the Communities Connect program. Reference: Peace River Block News. April 27, 1979 and September 21, 1989.